Generally, birds don’t get credit for being smart animals. Just think of the way the expression “bird-brained” is used. 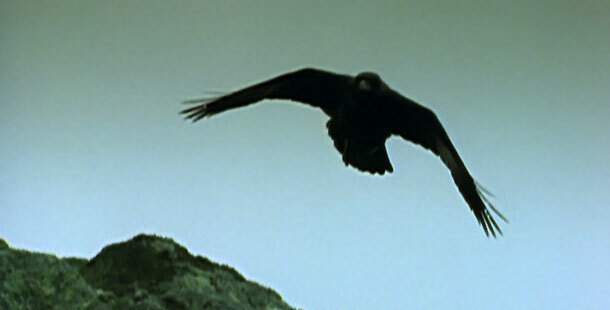 But corvids, which include magpies, crows, and ravens in particular, flutter in the face of this negative stereotype. Their behavior is often so clever, cunning, fun-loving, smart, and witty that it has motivated researchers to try to explain why. In fact, some scientists consider these black-feathered scavengers’ position on the intelligence spectrum to be on par with canids such as wolves, coyotes, and dogs, and have conducted experiments to try to quantify the raven’s brainpower. In NATURE’s Ravens we see zoologist Bernd Heinrich of the University of Vermont work with ravens to see whether they could learn to distinguish between strings bearing food and strings bearing rocks and modify their behavior based on their understanding. The ravens performed well, even when the level of difficulty was increased by crossing the strings. A central question that presents itself is whether the raven’s sharp behavior indicates complex cognitive processes associated with human learning. Johannes Fritz and Kurt Kotrschal of the University of Vienna, Austria, attempted to provide an answer with an experiment similar to Heinrich’s. Ravens were asked to perform a task — opening a box to get a reward — and then teach the behavior to their fellow birds. According to Henry Gee of Nature Magazine Online, while the birds’ performance indicates a high learning level, the results are inconclusive because it’s impossible to tell how the ravens learn: is it by a complex form of “imitative learning” or by a lesser process known as “stimulus enhancement”? Beyond explaining how and why ravens act as they do, it’s how this innate intelligence manifests itself in behavior that makes these birds fascinating to observe. As seen on NATURE, ravens achieve mastery and possess manipulative powers over other creatures in their domain, often letting others do work for them. For example, ravens will call wolves and coyotes to prospective meals so they can expose the carcass and make the meat accessible to the birds. In addition, ravens will show their true scavenger colors by waiting for other birds with specialized foraging skills to make a catch and then cunningly seize the defeated prey for themselves. Though it might be tempting to run right out to your local pet store to buy a raven, they aren’t available and, more importantly, are federally protected in the United States; it’s illegal to buy or even hold a raven (unless one has a difficult-to-obtain permit). However, many people successfully raise orphaned, nestling crows under 3-4 weeks old to the point where they are able to eat independently, and then release the birds when they are approximately eight weeks old. Information on diet and care of orphaned ravens, as well as a wealth of other material, can be found on the American Society of Crows and Ravens Web site.